Guardians of The Galaxy Vol. 2 is an amazing masterpiece that the entire family can enjoy and learn from. More than just a Marvel movie, the moral of this movie is quite clear. You can’t choose your blood- but you can sure choose your family. Marvel has created a stupendous franchise that is loved by all. Once again they have taken comic book characters that were little known by the children today but loved by their parents and grandparents and brought those characters to life in a most colorful and impressive way. Keeping it light with family friendly humor has become the basis of their movies so that the box office explodes opening weekend- and weekends thereafter- with people of all ages running to see the Marvel movies- not once, not twice, but sometimes, three or more times. Guardians of the Galaxy Vol. 2 was one of the most anticipated sequels of the Marvel franchise. Including more humor than many of the Marvel movies, Guardians was also aimed, in my opinion, more so at the younger generation with a funnier script, more of a lighthearted main character, and the unique compatriots he picks up along the way. After all, in what other movie does a mutated raccoon (Rocket) become a parent to a talking tree (Groot)? In Vol. 2, Chris Pratt (Jurassic World) reprises his role as Peter Quill/Star-Lord but this time he is trying to find out who is his "real" father. The story takes him on a quest that results in the answer that has always been right in front of him. New and old friends unite not only on Peter's journey but their own quest as well, choosing sides for reasons known only to them. Bradley Cooper (American Hustler) brings us, once again, Rocket Raccoon who, while tough on the outside, shows his true colors on the inside including loyalty and love not only the team but with Baby Groot (Vin Diesel; Fate of the Furious) as well. He nurtures and cares for this "baby" in a way that brings out a side of Rocket we haven't really been exposed to in the first film. Veteran characters return to what is now clearly a family- Zoe Saldana (Live by Night) is Gamora, Dave Bautista (Heist) is Drax (who also shows a softer side in Vol. 2); Karen Gillen (The Circle) is Nebula; as well as new characters Kurt Russell (Deepwater Horizon) as Ego (a name befitting his character) and Pom Klementieff (Hacker's Game) as Mantis. In addition, I didn't know such a squeaky voice could come out of Vin Diesel as he utters his famous ( and only) line, "I am Groot". Michael Rooker (The Walking Dead) plays Rondo, as he did in the first Guardians movie. Rooker should be given a notable mention separate from all the other actors because as amazing as the cast was, Rooker was able to switch emotional gears in almost every scene he was in. You didn't know if he was going to be the bad guy or good guy when the movie ended and the ending had me holding back tears proving what a great job he did throughout. The video is presented in two formats. The 4K Ultra HD (Disney first disc ever in this format) is presented in 2160p, with an aspect ratio of 2.39:1. Colors pop, especially when differentiating the blacks from colors in space. When Quill is taken to his father's planet, the schematic color scheme and details are remarkable. As always, while the 1080p HD Blu-ray, presented with an aspect ratio of 2.40:1 is clear and crisp, the details seen in fabrics, in costumes, and in colorization are markedly improved upon with the 4K version. Clearly, it is worth it to buy the 4K version even if you don't have a 4K Blu-ray player yet because eventually, everyone will have 4K capabilities in their home and the Blu-ray that is provided is still an excellent viewing experience in the meantime. Audio on both discs provided is presented in Dolby Atmos/Dolby TrueHD 7.1. The sound quality is terrific which only serves to enhance an excellent soundtrack. Background noises are appropriate and sound effects are beautifully done hitting the side and rear channels nicely. However, I love that the cassette tape plays like a real cassette and isn't enhanced. The creative (music) team did a great job keeping that sound authentic. The battle scene between Pratt and Russell was amazing. The special effects were captivating and eye catching and the sound was exactly what it should have been- not too loud to be overwhelming but just loud enough to make an impact. My only criticism is that that particular scene could have been cut in half and still have provided the same impact and wow factor. Guardians Inferno Music Video: Over 3 minutes of 70's style disco music video starring David Hasselhoff with an almost psychedelic twist. Making of the Guardians of the Galaxy Vol. 2: In the Director's Chair with James Gunn; Reunion Tour: The Music of Guardians of the Galaxy Vol. 2; Living Planets and Talking Trees: The Visual Effects of Vol. 2; and Showtime: The Cast of Vol. 2 are four featurettes bringing us a behind the scenes look at the cast, the music, the special effects, as well as the ingenuity of James Gunn. While all the extras are enjoyable this feature is my favorite because it's enlightening to hear the cast and crew talking plainly about how they enjoyed what they were doing and how it comes across just how much everyone values Gunn's creative insight. It's unfiltered interviews and insight and that is an invaluable bonus feature. 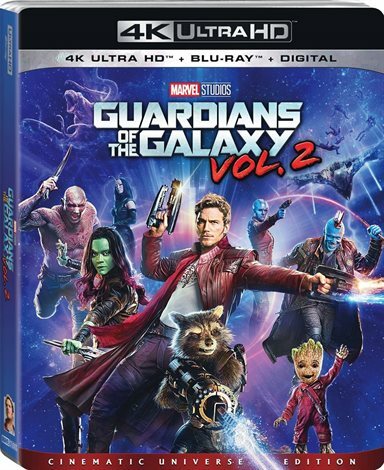 The Digital copy comes with some exclusive only content: Guardians of the Galaxy Vol. 2: Mission Breakout! In which we get to hear Walt Disney World employees talk about the latest- and greatest- ride at the Walt Disney parks. There are also three featurettes providing about an additional hour (yes, 60 additional minutes!) Scene Breakdown and Storyboards- one for each of the following scenes: Elector Escape; Gamora and Nebula; and Rocket and The Ravagers. I love watching how the scenes developed from the storyboard to CG and special effects to what the audience actually sees. This a must see for any budding Sci Fi film makers You also have the additional option to purchase the soundtrack and collectibles when you redeem your digital code. Guardians of The Galaxy Vol. 2 is an amazing masterpiece that the entire family can enjoy and learn from. More than just a Marvel movie, the moral of this movie is quite clear. You can't choose your blood- but you can sure choose your family. Download Guardians of the Galaxy Vol. 2 from the iTunes Store in Digial HD. For more information about Guardians of the Galaxy Vol. 2 visit the FlickDirect Movie Database.